These Chapel Hill neighborhoods with a community pool are in the Chapel Hill/Carrboro City Schools. A community or neighborhood pool is a wonderful way to cool off on a hot summer day and a good way to get the kids outside and having fun. Meeting neighbors is easier with a natural neighborhood gathering place. In some neighborhoods the pool is included in the HOA dues and in some it is a voluntary membership. Some of the pools are open to membership outside the neighborhood so if you really want a community pool check and see if outside memberships are allowed. It may open up your search to more home possibilities. Let me know if you would like more information or insight into any of these neighborhoods. The Chapel Hill Summer Swim League is a good resource if your child wants to swim competitively. It’s a volunteer organization. 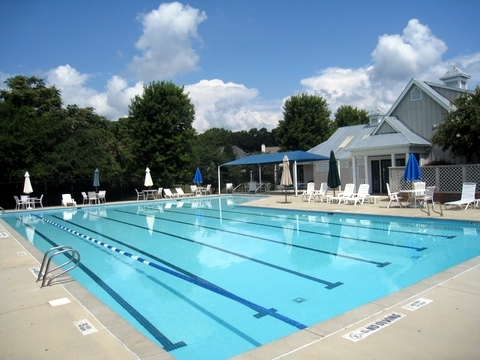 Governors Club,Briar Chapel,Westfall,The Preserve at Jordan Lake all have community pools. These neighborhoods are north of town. Developed in the early 1980’s Stoneridge was the first phase. The 2nd phase, Sedgefield, was developed later in the 1980’s. I-40 was built after Sedgefield was developed and some of the homes have road noise. The neighborhoods have large 1+ acre lots with prices in the $400’s and up. The homes are of varying styles, contempory (1980’s style) and traditional. The convenient location between UNC and Duke, the beautiful lots, and neighborhood amenities help compensate for the dated interiors of many of the homes. Larkspur is in North Chapel Hill convenient to I-40 but not so close that’s it’s a noise problem. There is a railroad track running through the neighborhood. The only train using the track delivers coal to the UNC power plant and doesn’t run often. Homes are in the $450,000-$800,000 range. Lake Hogan Farms is north west of town in the Carrboro planning district and a Chapel Hill address . Wexford has 1/2 acre lots and has been built out since the mid 1990’s except for a few homes built several years ago on Traemore. It’s across Homestead Road from Lake Hogan and connects to other Carrboro neighborhoods. Homes are in the upper 400’s and up to around $700,000 Here is a quick video with some neighborhood info. Residents of other neighborhoods can join the Southern Village Club and Pool. This is great because there are several neighborhoods within walking distance. Here are some homes for sale in neighborhoods in and around Southern Village. Ridgefield/Briarcliff are older neighborhoods built in the 1960’s. Prices are great, mostly in the mid $200’s to around $400,000. The lots are pretty and the location is great and on the bus line. Claremont is by the same builder/developer as Larkspur and followed along shortly after. It’s been very successful and a new phase is planned across Homestead Road from the current phase. Prices are in the 400-700,000 range. Home plans are traditional with some builder design features that are different and set the homes apart in style. The big drawback I hear is that the homes are very close together. Large homes on very small lots. I think that in a few years landscaping will grow up and soften the street scape. Winmore is adjacent to Claremont with similarly priced homes. More about Winmore here. These neighborhoods are located about 7 miles south of Chapel Hill. They all share the pool, tennis, playgrounds, common area lake (small). The Amenities are located in Governors Park and the use is included in the HOA dues.